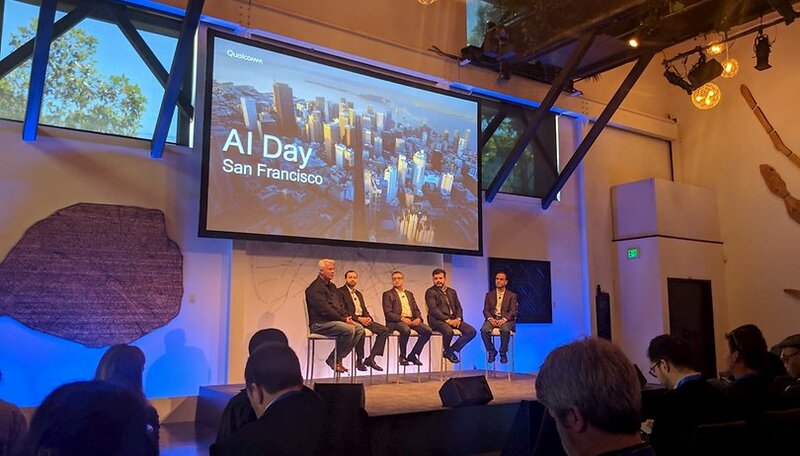 At its AI Day in San Francisco, Qualcomm announced that it is bringing artificial intelligence to the cloud with the Cloud AI 100, an AI accelerator for data centers. The American chip giant has built Cloud AI 100 from the ground up to increasing demand for AI inference processing in the cloud. Qualcomm says the new platform facilitates distributed intelligence from the cloud to the client edge and all points in between. On stage in world’s tech epicenter, Qualcomm president Cristiano Amon and senior vice president, product management, Keith Kressin, were reluctant to give too much away about Cloud AI 100, but the numbers presented were bold - 50x more performance with 10x more performance per watt than anything available today. We did get one stat - 350 TOPS peak AI performance. The accelerator, which is built on 7nm, could significantly raise the bar for the AI inference processing relative to any combination of CPUs, GPUs, and/or FPGAs used in today’s data centers. This is not a modified or scaled up Snapdragon 855, according to what we were told. This has been built from scratch. Testing is taking place this year, with customer samples going out in the second half of 2019. Production is set to start in 2020. What is artificial intelligence in the cloud for? The idea is that by creating more powerful AI in the cloud, Qualcomm is attempting to bridge the gap between your device and the server. This middle-ground is known as cloud edge, and Amon believes it will make ‘the device and the cloud inseparable’. A huge part of this, of course, is 5G, which binds everything together. Qualcomm is supporting developers with a full stack of tools and frameworks for each of its cloud-to-edge AI solutions. The company believes that by facilitating the development of the ecosystem in this distributed AI mode, it will help enhance a myriad of potential experiences for the end-user, including personal assistants for natural language processing and translations, advanced image search, and personalized content and recommendations. Microsoft and Facebook representatives were also on Qualcomm’s stage in San Francisco, but during a Q&A session, Kressin wouldn’t be persuaded to talk about customers for Cloud AI 100. "The focus is one the tier ones, but the proof is in the testing," he said, adding that he was confident of attracting a solid customer base. Kressin is also not worried about the competition from NVIDIA, Google Edge TPU and any other cloud company which wants to develop its own AI hardware, especially when it comes to attracting talent. "If you’re a silicon engineer and you want to work on innovative new technology, you go to a silicon-centric company. We know silicon." Qualcomm predicts that by 2025, the market for AI inferencing in data centers will be worth $17 billion, and its inferencing rather than AI training that remains the focus for now. Are you ready to start living on the (cloud) edge? With 5G set to fuse together the device and the cloud, the use cases for this increasing connectivity spread far and wide. He envisions a world where virtually everyone and everything is intelligently connected. That means gaming, automotive, smart home extended reality (XR), drones, robotics, audio, IP cameras and more. Microsoft’s Hololens platform is a primary example. Venky Veeraraghaven, group program manager at Microsoft Azure, said that the edge will bring cloud-like functionality but much, much closer to end devices. In terms of transportation, 5G and the edge cloud will lead to greater autonomous capabilities, better driver awareness monitoring and personalized driver settings. The automotive AI cockpit of the future will be scaled according to vehicle class, and cars equipped with Qualcomm’s 8155P chips - based on the Snapdragon 855 - will arrive by 2021. Nakul Duggal, VP product management for automotive at Qualcomm, said that anyone who spends $50,000 on a car by then will expect it to have four SoCs. When it comes to gaming, Cristiano Amon was crystal clear: "The cloud is the new console, it’s just a matter of time." Qualcomm also showed off its three new mid-range chipsets, the Snapdragon 665, 730 and 730G. We covered the launch of these processors in a separate article, but it was interesting to hear that Qualcomm’s edge cloud will also allow its AI engine and AI capabilities to be possible on devices lower down the food chain in the smartphone business. What do you think about the news coming out of Qualcomm AI Day 2019? Have your say in the comments below. If you do not want cloud storage tough luck. Now you will be forced to use it. I prefer to keep my data in my own hands. I do not want to be paying data and storage charges for it. The cloud is just a money making scam and an insecure way o keep your data. Up to a point, cloud storage is useful, but it's also "sensitive stuff" that needs to be kept very secure, and then cloud storage is not the best. However, the boundary between the two parts can not be clearly delimited, depends very much on the needs of each user.